First aid is known as the provision of initial care as a means of helping individuals who are suffering from an injury or illness. This initial medical care is usually provided and executed by a non-expert but who is trained in attending to the needs of an injured or sick person until more advanced or definitive health or medical treatments become easily accessible. In case of minor injuries or any health conditions and illnesses that are only self-limiting, further medical care and attention after the first aid solution may no longer be required. First aid is composed of a set of simple yet life-saving strategies performed with the least equipment. First aid has three major aims and these are preserving life, preventing further harm and promoting immediate recovery. First aid can also be defined as the direct and immediate treatment conducted to an injured person. If you know the basics of medical care and treatment, then you can administer first aid solutions in case of certain emergencies. Among the many simple procedures that you can use in providing first aid are dressing a wound, preventing the loss of blood by the application of pressure, setting a bone using a splint, treating burns using ointments and cardiopulmonary resuscitation (CPR). First aid solutions can be administered in case of burns, near drowning, choking, head trauma, seizures, insect stings and bites and breathing difficulties. 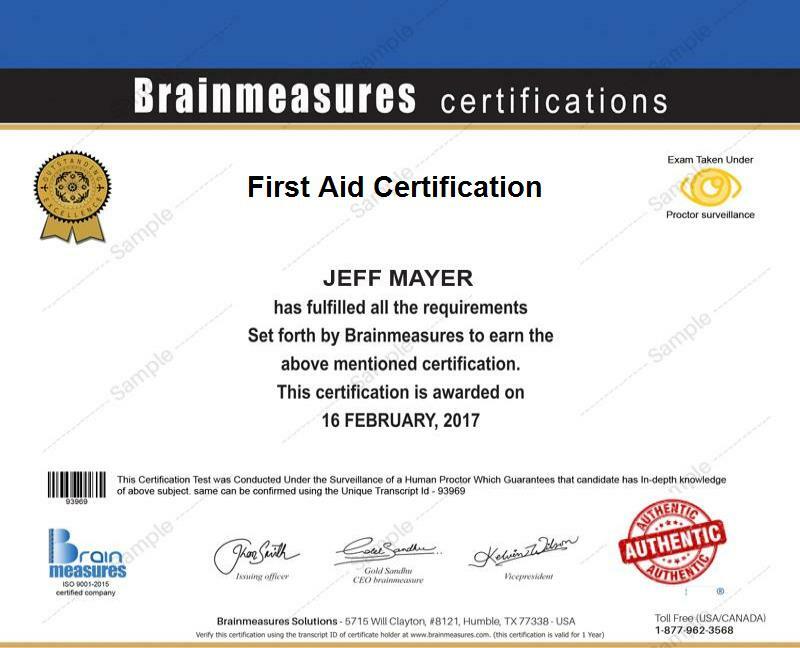 If you want to learn more about the most effective first aid solutions and techniques, then be aware that Brainmeasures, one of the leaders in the online certification and skill testing industry, offers a first aid certification course. The first aid course which you can take from Brainmeasures is actually part of the company’s platinum personal trainer certification package which is composed of twelve different courses that are all linked to helping individuals reach the highest level of fitness and health. If you have longed to become a first aid practitioner, then rest assured that you can take up the first aid certification course alone. What makes enrolling in the first aid certification course from Brainmeasures beneficial is the fact that it can offer you the most comprehensive training which covers all the aspects linked to first aid as well as all the methods that you can use for your potential patients in case of emergencies. Completing this certification course will allow you to become a certified first aid professional and start helping others with your ability to provide initial medical care when the need arises. How to apply bandages correctly? What can you do in case someone suffers from an electric shock? How to initially treat wounds, sprain and splinters? Since medical emergencies are somewhat inevitable, everyone is advised to take up a first aid certification course so everyone will know exactly how to effectively deal with emergencies. The program is most ideal for students, individuals and professionals who wish to gain a full understanding about the basic survival skills as well as the most effective first aid solutions and treatments for minor and severe injuries and emergencies. Practicing your career as a first aid certification holder also gives you the opportunity to enjoy a more stable and steady flow of income. As a certified first aid practitioner, you can expect to earn around $36,000 to $112,000 per year if you decide to work fulltime. You also get the chance to receive yearly bonuses of around $2,000 to $45,000. Note that your pay will also be fully dependent on the position that you hold, your location, the stability of the organization which you are working for and the level of your knowledge, skills and experience.